The National Trial Lawyers: Top 100 is an invitation-only organization composed of the premier trial lawyers from each state or region who meet stringent qualifications as civil plaintiff and/or criminal defense trial lawyers. Selection is based on a thorough multi-phase objective and uniformly applied process which includes peer nominations combined with third-party research. Membership is extended only to the select few of the most qualified attorneys from each state or region who demonstrate superior qualifications of leadership, reputation, influence, stature and public profile. 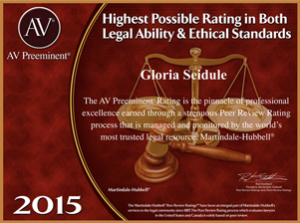 Gloria’s rating of AV Preeminent® (4.5-5.0) – AV Preeminent® is a significant accomplishment – a testament to the fact that her peers rank her at the highest level of professional excellence. 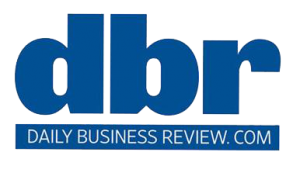 Daily Business Review (DBR) is designated the official court newspaper by the chief judges of the state judicial circuits in Miami-Dade, Broward and Palm Beach counties and by the U.S. District Court for the Southern District of Florida. Top Verdicts and Settlements is one of DBR’s signature issues, and in 2014, Gloria Seidule was among the personal injury attorneys to appear on the list. Gloria was featured in ALM’s annual listing of the most highly regarded lawyers in South Florida – all of them having achieved the prestigious AV Preeminent® ranking from Martindale Hubbell®. The Martindale-Hubbell® Bar Register of Preeminent Women Lawyers™ is the definitive guide to the most preeminent women lawyers in the United States and Canada. 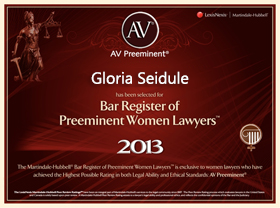 You must be rated an AV Preeminent® woman lawyer to be included in the Bar Register of Preeminent Women Lawyers—receiving the highest ratings in professional ethics and legal ability from your peers. 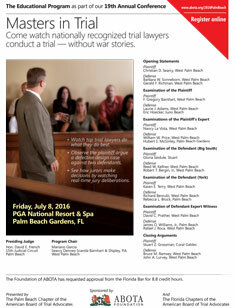 This event was an opportunity to watch nationally recognized trial lawyers conduct a trial — without war stories.• Watch top trial lawyers do what they do best.• See how jurors make decisions by watching real-time jury deliberations.